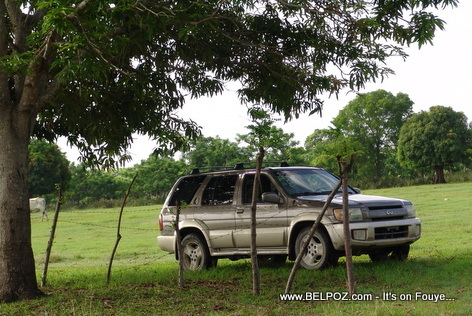 Look at this photo... an SUV parked in under a mango tree next to an agricultural fence in Haiti. You may be looking at this photo thinking it's in the middle of nowhere. It's not... Less than 200 yards from that mango tree is a big modern Haitian home being built by a diaspora who plans to retire in Haiti. In the not too distant future, there will be a road, in the exact spot you see this vehicle parked.